No special meaning to the name, it just sounded so bright and cheerful to me! Nothing like the perfectly-slouchy Yulie to brighten a chilly day! 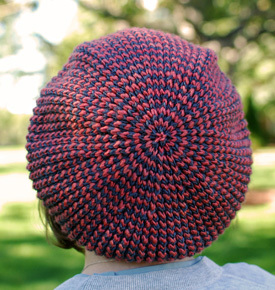 The hat or beret is deceptively simple to make, and uses very little yarn. The basic lace stitch pattern is worked with two colorways of yarn alternating every round, but there’s no jog or seam or carrying yarn up the side. 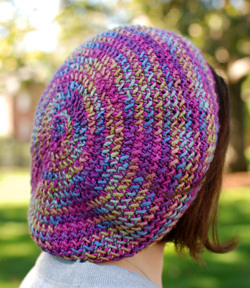 What’s more, an interesting colorful pattern is formed on both sides, making the beret reversible. The “right side” is dominated by the main color, with clusters of the contrast color dotting the background. The “wrong side” is my favorite of the two, with loops of the contrast color swirling all the way around. Use solid or variegated yarns for different effects: your choice! At most you will need 100 yards of each color – what a clever way to use up all those single skeins of luxury silk/merino blends! Please allow a few extra yards if you intend to add extra slouch ;). The smallest size should fit a young adult, and the largest size is for a large woman’s head, or a woman who’s mindful of flattening her hairstyle. The hat shown here is the largest size, and did not have any extra slouch added. 17.3 (18.7, 20)”/44 (47, 51) cm brim circumference; to fit 19.3 (20.7, 22)”/49 (52.6, 55.9) cm head circumference. 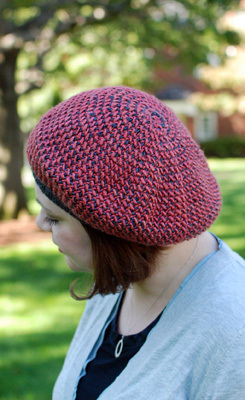 Please add extra yardage if you intend to make your hat more slouchy. US 5/3.75 mm: set of 5 dpns, at least 7″ long. US 7/4.5 mm: set of 5 dpns, at least 7″ long. US 7/4.5 mm: circular needle, 20″ or 24″ long, or size needed to obtain correct gauge. 4.5 sts and 10 rnds per 1″/2.5 cm in 1×1 ribbing using US 5/3.75 mm needles. 4.5 sts and 6 rnds per 1″/2.5 cm in stockinette stitch using US 7/4.5 mm needles. 5.5 sts and 6 rnds per 1″/2.5 cm in pattern stitch using US 7/4.5 mm needles. Basic lace knitting, increases and decreases, knitting in the round, reading charts. 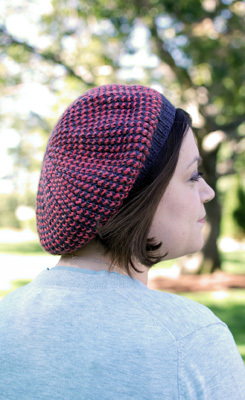 Wondering how Yulie will knit up in a variegated yarn? 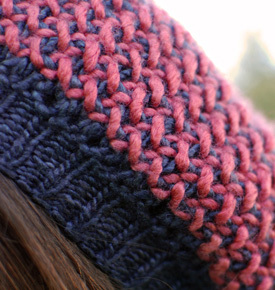 The beret above was knit using one solid colorway (MC: Lion & Lamb in Berry (#23ns)), and one variegated colorway (CC; Lion & Lamb in Watercolor (#18)). The so-called “Smarties” version :). The wrong side shows off the variegated yarn beautifully! This free pattern is now available! Click HERE to download through Ravelry! It’s not a Rhinebeck sweater, but I’m so glad I have my own little Rhinebeck hat to wear next weekend :). See you there! I love this hat! The shape is just perfect IMO – just slouchy enough, but not sloppy. Off to queue! The hat is adorable! Are you wearing the smartie version to Rhinebeck? I’ll be there and will keep my eye out for you! I’m hoping it’ll be cool enough to wear my new (and first) sweater!! Wonderful in both the “smarties” colorway and the more subdued charcoal and brick. I’m off to sort stash for two or three of these for holiday gifting! Beautiful! I’ll be looking for your Pretty beret at Rhinebeck! See you there! I just love your new hat, being in a gearing up for winter mode & preferring smaller projects(too many sweater UFO’s) I have got the pattern & a suitable yarn is in my stash, guess what I’ll knit tonight ?!? Thank you as always for your beautiful patterns, I am a great fan of yours. beautiful hat! I’ll be adding this to the top of my hat list! I love this! And am looking forward to the scarf pattern too! Beautiful! I love your color combo on both hats. Love it! 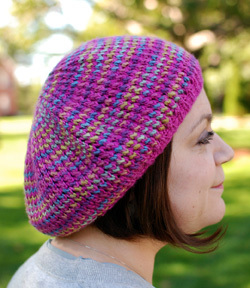 I am always at a loss for what to make from variegated yarns but I love this hat. I just bought the pattern and can’t wait to use up some of these beautiful colorful yarns I’ve had sitting around for way too long. love that hat kathy!! gorgeous! I started Yulie but I have a question about the increase round. The way I read your instructions (I’m making the largest size) I’m adding 2 stitches repeated 15 times for 30 additional stitches. When you add these to the original 90 I get a total of 120 not 150 as the pattern states. Gotta love such a gorgeous way to use up leftovers! Thank you!